Years and years ago, when I was first diagnosed with “schizophrenia,” as a first year philosophy doctoral student, the question foremost in my mind was whether or not it was even possible for “someone like me” to finish a PhD. I remember on many occasions debating the possibility with my therapist—she was certain it was possible, I was certain it was not. “Show me the proof,” I’d say, “even one example of someone with psychosis who is working as a philosophy professor….” You could say that I had her there. That didn’t stop me from posting on every internet forum I could find, and creating a blog—long since lost to the technological ether—that I conceived as a cross between a “distress signal” and “homing device.” The fantasized philosophy graduate students with psychosis that I still half-believed in, however, in spite of my claims to the contrary, didn’t materialize. Or at least not for years. Nowadays, whether I’m talking to young people with psychosis or family members, I’m repeatedly asked for the same thing: “proof” that someone with psychosis or ‘schizophrenia’ can be a doctor or an architect or an FBI agent (not making that last one up). They want to know what sorts of accommodations or modifications people in a particular field (architecture or social work) have asked for, and whether or not they’ve disclosed. If they’ve disclosed, what have the consequences been. In some areas, responding has been possible, if still in a limited way. For instance, there are a number of public mental health leaders with lived experience of psychosis (advocates & activists, psychologists, psychiatrists, social workers, and so on) as well as artists and writers (both historical and contemporary). In a whole host of other areas, however, everything from business leadership to diplomacy, secondary education, or working in a tech start-up, there are few or no existing first person accounts out there. Speaking in more general terms, the relative “invisibility” of working adults (and students) with psychosis helps reinforce the societal myth that psychosis and “success” are incompatible. Demoralization, lowered self-expectations and—notoriously for young people with the highest levels of so-called “pre-morbid functioning”—even suicide can, and all too often do, follow an initial break. These processes are often insidious, and even in early intervention settings, I’ve heard not only youth but also family members and clinicians reiterate the importance of “scaling back” and “rethinking” college or once-dreamed-of careers. Our goal with Stanford VOICES’ “Work & School Stories” project is to change things. The project aims to collect work and school narratives from adults with (current or past) psychosis who consider themselves “successful” in an array of different vocational settings and careers (chefs, social activists, researchers, commercial artists and so on). 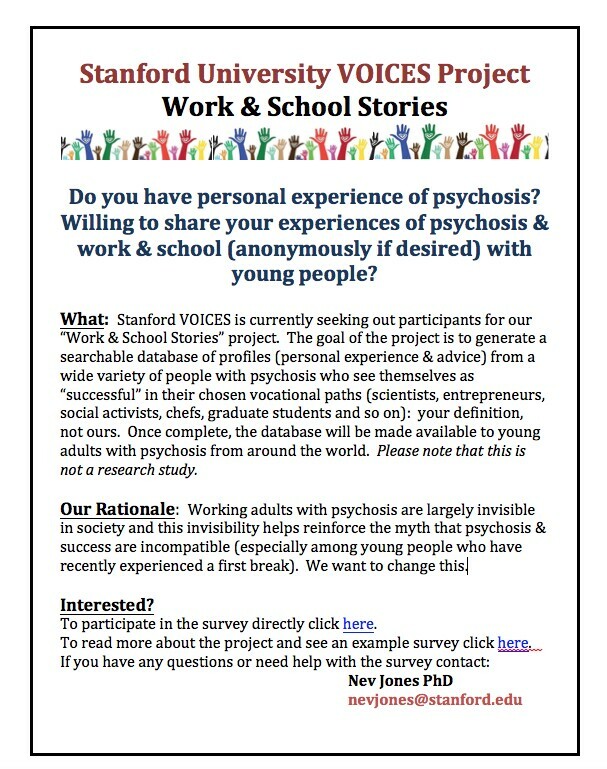 Using a structured survey with all open-ended questions, we ask participants to say as much or as little as they want about their experiences of navigating psychosis in work and/or school, and for any advice they might have for young people imagining a career in their area. Eventually, we plan to reformat these questions as profiles that will be entered into a searchable database targeting youth and young adults. The profiles—which can be anonymous or not (we expect many to be anonymous)—will be searchable by such categories as profession or position and college major. This will be a non-proprietary database, publicly available to young people around the world as well as the broader community. Flyer. Our project flyer is available as a pdf or jpeg. We’re asking anyone who is willing to disseminate our flyer (or this blogpost) to colleagues and contacts, especially outside of mental health fields where it will be the hardest to get the word out. This is not a US-specific project and we encourage participation from people around the world. Survey. A direct link to the survey is available here. Website. Visit our project website for additional information (including a sample completed survey). On behalf of the project team, our thanks to everyone in advance for their help and participation.